According to the US Department of Energy lighting makes up for 6% of the energy a household consumes making it the third largest consumption factor behind heating and cooling. A good way to save electricity is by replacing all the incandescent bulbs of your household with Energy Star bulbs (either led or fluorescent bulbs). According to Energy star if every household in the United States had replaced only one conventional light bulb with an energy star bulb, that would result into savings enough to provide lighting for 3 million houses for an entire year. That in financial terms means savings of $600 million per annum. In addition greenhouse gas emissions would be cut by almost 9 billion pounds per annum. This is the equivalent of taking 800,000 cars off the roads. Every hour you leave on a 100W light bulb you produce enogh carbon dioxide to fill up two party balloons. 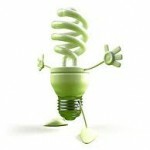 Energy efficient light bulbs such as LED and fluorescent outlive by more than 12 times the conventional incandescent ones. In addition they user around a fifth of the energy used from incandescent bulbs so at the end they result in significant savings. It is a myth that energy efficient light bulbs take a long time to reach their full brightness level compared to incandescent ones since modern ones don’t take more that a few seconds to reach that level.